IBG-PASS Pro Stock series car owner Steve Webster passed away this weekend after complications from multiple injuries which he suffered in early June during an industrial accident. Webster suffered a fractured skull, broken ribs and other injuries and was in ICU at a Massachusetts hospital following the accident at the auto body shop he owned, Steve’s Auto Body, in Hampstead, New Hampshire. Webster and Cabral also shared something in common. They both owned body shops in southern New Hampshire. Webster took the old fashioned approach to becoming a car owner. Instead of just writing a check and picking up the latest and greatest equipment, he worked as a crew member first. He turned wrenches for the ACT team of Tom Quinney and later was on the crew for the NASCAR Busch North Series team of Fred Skaff. Later in his career, he bought a Pro Stock and had Babe Branscomb, Skaff and Cabral behind the wheel. Webster leaves behind his wife, Ann, and a step-son Chris. Calling hours for Webster will be held Tuesday from 4 to 8 p.m. at the Douglas & Johnson Funeral Home, 214 Main Street, Sale, New Hampshire. Funeral services will be Wednesday at 10 a.m. at the First Baptist Church in Salem. Memorial contributions may be made to the Alzheimer's Association, 10 Ferry St., Suite 427B, Concord, NH 03301. Webster (by spoiler) helps Bobby Cabral push the #55 to the grid last year at Lee. Last week, Webster had been moved into a private room and showed major signs of improvement. He spent time with his wife, spoke with team members and was able to walk around before his sudden passing this weekend. Ever the racer, Webster talked about getting out of the hospital and going racing as soon as possible. 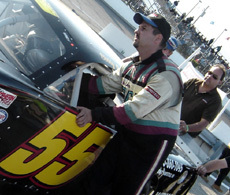 He owned the #55 cars driven by Bobby Cabral in a limited schedule of PASS events.